Japanese Dance in Sapporo Japan. Yosakoi is a Traditional Japanese dance that started in the city of Kochi in 1954. The dance is usually performed in large groups ranging from 20-50 people choreographed to music with the dancers wearing colourful outfits. 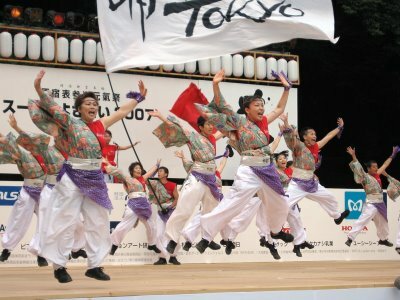 The participants are a mix of people from yosakoi dance schools and local dance teams with men and women of all ages. One year I saw a dance group of elementary school children and they were sooooo cute. I also saw a group of seniors that were amazing! They had colourful make up and I didn't realise their age until i was up close. Their dance routine was a bit less energetic than the other dance groups, but the synchronisation was spot on. Yosakoi means "come at night". The Yosakoi festival is one of the most energetic and interesting to watch Japan festivals of the year, which takes place in early June in Odori Park, Sapporo Japan. Check out this video below from the 2007 festival to get a feel of the atmosphere and the varying types of costumes and styles. In Japan history the Yosakoi dance was originally based on a song written by Takemasa Eisaku called, "Yosakoi Naruko Dancing". The original competition in Kochi stated that each team's chosen piece of music had to contain a piece of this original music, so most of the Japanese dance acts are very similar and can become quite boring after you've seen a few groups (a couple of hours is definitely enough for me). However, some festivals or competitions in other areas around Japan may not state this rule and allow teams to create their own music, so you may see more modern music incorporated into the dance routines. These are the groups i try to find. The more unique, the better in my opinion. The festival is even televised, but I don't understand why anyone would want to watch it on TV. Odori Park has a great atmosphere during this festival and it's really fun to lounge on the grass and watch all the commotion around you. Every team has their own unique costume containing bright, eye-catching colours. Usually performers wear "Happi" coats and "yukata". Sometimes you will see groups wearing costumes based on Japan history or popular trends. Usually, all the members wear the same costume and it is an impressive sight to behold when everyone is dancing simultaneously in time with the music. Each dancer in the group also uses small wooden clappers called "naruko" in their performance. 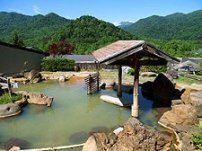 They were originally used to scare birds away from rice fields in Kochi Prefecture. The traditional "naruko" has yellow and black beaters, but most yosakoi groups create their own to match their costumes. 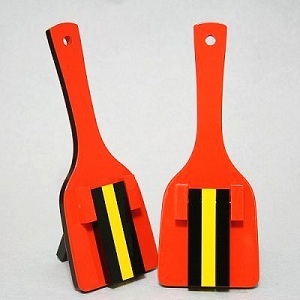 These wooden clappers must be used in the performance but groups also use other instruments or props as part of their acts such as drums, flags and batons. The dates of the Yosakoi festival are usually around the start of June. The venues are in and around Odori park, downtown Sapporo.